From MeraBreak app, you can earn points by taking part in fun challenges and redeem those points for various rewards. The thing that I liked most about MearBreak: It's fun. There not many make money apps that are this fun to use. Once you start using the app you'll be addicted. Points can be redeemed for many gift cards and recharge. For more free recharge you can try mCent Browser. And to earn paytm cash by answering quizzes try this app. 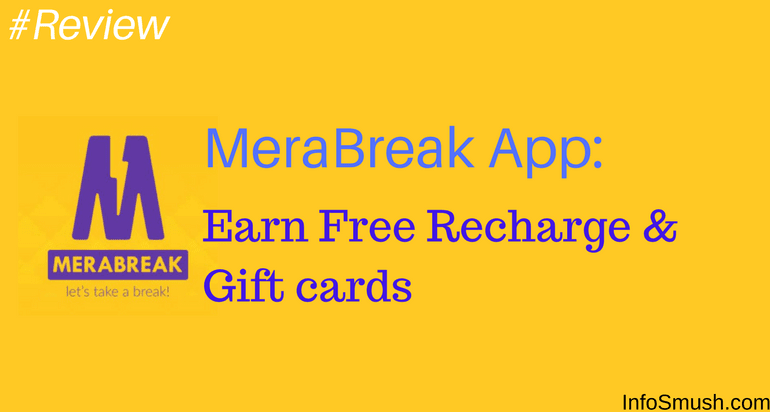 MeraBreak is an app where you can earn points by completing challenges- quizzes, puzzles and word games- and use those points to recharge your mobile or get Amazon, Flipkart, Myntra, etc. Gift cards. 3. Now you'll be redirected to Play Store. 5. Now enter your full name, email address and password and tap on Sign up. 6. Enter your mobile number. 7. You'll receive an OTP. 8. If the app doesn't automatically detect the OTP enter it. 9. That's it. You'll get your sign up bonus instantly. Yes. I have used the app myself and redeemed the points for an Rs. 10 recharge. The recharge was done within 2 minutes. So, MeraBreak is a legit app. Choose any challenge from the various categories. For every correct answer, you'll get reward points. The number of points varies depending on the challenge. Sometimes you will get 3 points per correct answer and sometimes 5 points or more. MeraBreak also has many puzzle challenges. You can earn 10-30 points for every puzzle that you solve in the given time. Every day you will get one chance to spin the wheel. With this, you can win up to 100 points. You will get Rs. 2 (100) points for every friend that uses your referral link. Your friends will also get 50 points when they use your referral link. Use this referral link to get 50 points. Play MCL and you can win prizes like Vivo V9, Redmi Note 5 Gift vouchers and much more. Every user has to select a “Home Team”. This Home team once selected, will be frozen and locked for the entire T20 season. Users will NOT be able to change their Home Team after selection. So think it through before moving forward! On days when the selected “Home team” is not playing a match, users are asked to select their “Favourite Team” between the 2 options of teams playing the match on that day. Based on the Home Team and Favourite Teams selected, users earn points on the app. These points are based on the actual performance of those teams on match days. Eg 1: If Team A is chosen as the Home Team/ Favourite Team which is batting currently. User will start earning points only after the first set of 5 runs is made. Every 5 runs, user will earn 1 point. Along the way, if 6s and 4s are made, besides earning 1 point per set of 5 runs, users will earn bonus points as per the table above. E.g 2: If Batsman hits 60 runs user will earn total 20 points. 3.Earn points based on your Cricket gyaan. Answer questions on cricket trivia during Strategic Timeouts & Inning breaks during the match. For every correct answer, user will earn 5 points. On MeraBreak App 50 points are equal to Rs. 1. You can use the earned points to recharge your or any mobile number. You can no longer use the points to recharge, but you can still redeem your points for Amazon, Flipkart, Myntra and Book my Show Gift Cards.